Encoder/Signal Cables PUR UL/CSA acc. 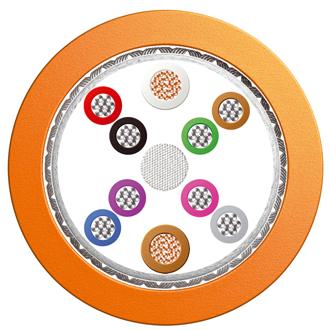 to INDRAMAT standard INK | Belcom Cables Ltd.
Interconnecting cable for Indramat® encoder for chain systems. •Oil Resistant VDE 0472 part 803 A/B •UL/CSA Approved UL Style 20233 80 ̊C -300V CSA- C22.2 N.210-M90 75 ̊C -300V FT1 •Toxicity Halogen Free • Available as terminated assembly to order ® Indramat is a Rexrotn Trademark.